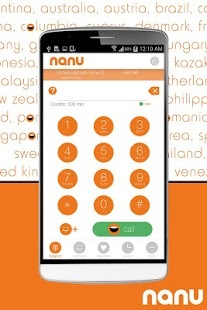 Nanu is a revolutionary app that allows you to make free calls on your mobile phone, wherever you are. What’s revolutionary about nanu? Well first of all, nanu doesn’t need a fast network so it works on 2g and congested networks too. In other words, it works anywhere your phone does (in the elevator, the subway, the car etc). Plus nanu sounds crisper and clearer. And second, it’s completely free. And that includes calls to non-nanu phones such as landlines and mobiles. nanu is on a mission to provide free phone calls to everyone, everywhere. The more people who use nanu, the more we can offer free calls. So please help us by sharing the good news with your friends! Great app! Clear reception. Great app. Some people don’t bother to read instructions n give poor rating unfairly. Can call non-nanu phones..just at + sign to country code! Can’t voice verify in singapore When the call back came to verify I could not hear a thing on the other end and I’m living in Singapore. Therefore can’ t use the app at all unless you are verified, any solutions? I recommend developers to do proper testing before releasing to public. Phone I’m using is xiaomi redmi. Good free call app Tried both local and international call, call quality is crystal clear in international call but local calls get voice disturbance some times, please increase non nanu credits Good app I’ll recommended to other’s .